We were nervous about this hike days before. 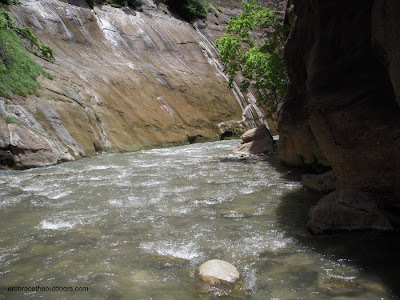 Don't know if it was fear of a flash flood, the weather report said chance of afternoon showers, or the thought of hiking through the cold Virgin River but we didn't decide to do it for sure until the night before. Once decided we headed over to one of the outdoor adventure companies in the nearby town of Springdale and rented canyoneering shoes and neoprene socks, definitely worth it. 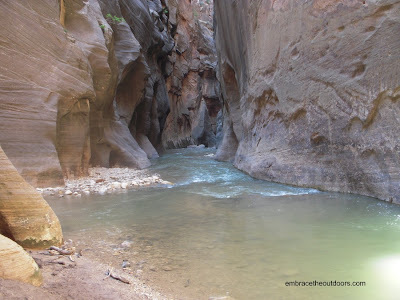 We were going to hike the Narrows bottom up which does not require a permit. We headed out in the morning, not too early, hoping the sun would warm the water up some and not too late because of the possible afternoon showers. We took the Zion shuttle to the Temple of Sinawa stop. We began our hike on the Riverside Walk, an easy paved walk along the river. It's fairly flat and one mile to the beginning of the Narrows. There were quite a few people taking pictures but no one going into the water. After a few minutes we changed into our shoes and socks and entered the river slowly. It was cold but warmer than we expected. We seemed to be the first people into the river that morning. We headed up the river into the canyon with water levels reaching chest level initially at which point we were glad we had packed everything in our packs into plastic bags. 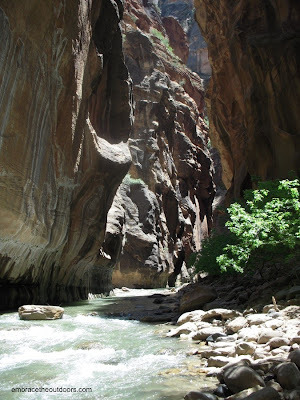 The 1000ft deep canyon is only 30 feet wide in places with water filling it from side to side in most places so you have to wade right through it. Most of the time the water was ankle to waist deep. 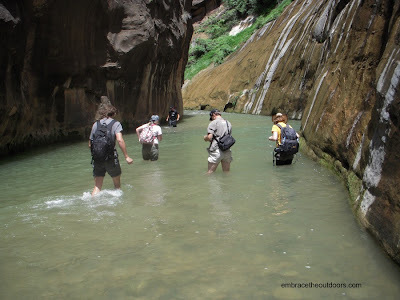 While hiking up the river we had to cross it several times to avoid obstacles and look for the shallower water. This is when the wooden hiking stick that came with the shoes and socks came in handy as the current was always pretty strong. After about a mile in we saw people coming up behind us and were glad that we weren't the only ones out there. We hiked about three miles up the river, just past the orderville canyon split, and took a break on a few rocks before turning back and heading down the river. The hike took the better part of our day but was definitely worth it. We recommend anyone doing the hike to get the canyoneering shoes and make sure to pay attention to the weather before you head out. Definitely one of the best and most unique hikes we have done. Would love to do it again someday! Wow looks like a really cool adventure! !